Adjustable clamps let you raise or lower each acrylic compartment. Green-edged acrylic is durable yet attractive. This catalog holder will help you successfully distribute your catalogs and large format publications. 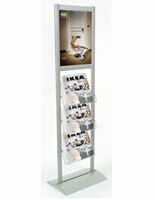 The literature stand, catalog holder has (3) green-edged, acrylic pockets to allow readers visual access to headlines. This catalog holder, such as our other indoor literature systems, is ideal for organizing and presenting catalogs or other large-format publications. 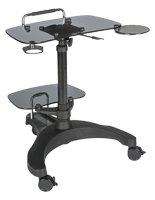 You can use this fixture as both a retail stand and an office or lobby organizational rack. 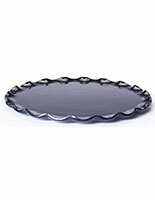 The catalog holder is constructed from brushed aluminum and features a smooth silver finish for additional elegance. This indoor fixture, catalog holder is therefore resistant to rust! The publication rack is also an adjustable catalog holder! We provide this catalog holder with moveable brackets, allowing you the freedom to alter your stand. 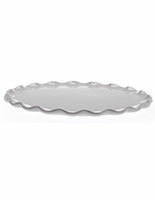 The catalog holder also has an 18"w x 24"h graphic area for advertisements or eye-catching posters. We even provide the catalog holder with (2) clear, plastic lenses to protect your graphics and present you the option of creating a double-sided fixture. 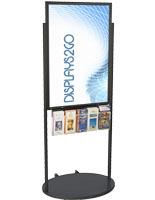 This catalog holder, also known as a literature system, is an eye-catching fixture you and your visitors will love!